The notion of public space will be in the spotlight at the V&A Silo District as engagement unfolds around a programme of talks, debate and performance. 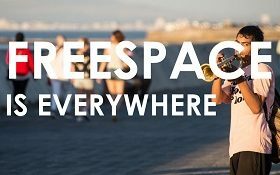 #FREESPACE is an events programme provoking different notions of public space that takes place at the Zeitz MOCAA and V&A Silo District, at the V&A Waterfront from 17 January – 17 February 2019. The notion of public space will be in the spotlight at the V&A Silo District as engagement unfolds around a programme of talks, debate and performance, hosted at the Zeitz Museum Of Contemporary African Art (MOCAA) from 17 January. The month-long event, titled #FREESPACE, will offer a South African and international audience the opportunity to discuss and engage with the concept of space from a cultural, architectural, urban and personal perspective – space as a resource, and space as a binding medium between people. #FREESPACE comprises a range of platforms of expression, an immersive symbolic container installation including artistic interventions, a programme of wide-ranging events and an online platform to share public views. Due to South Africa’s absence from that Biennale, #FREESPACE is partly a South African response to this global event. It intends to create a platform to engage with this curatorial proposition and enable the expression of public and specialist views. Discussion around space is critical within a South African context. Like other cities, Cape Town is marked by inevitable contradictions and tensions. Contemporary urban dynamics still tend to perpetuate the patterns of a dissented city, with its class, race and cultural characteristics marking the built fabric. The urban debate around the resource of space is profound as the post-apartheid city struggles with valuing space, in terms of its sustainable use, ownership, shared meaning, and how it can express the multiplicity of evolving contemporary identities. In response, #FREESPACE aims to create a temporary space of meaningful engagement, disentangling some of the aspects informing the production of space. For the latest updates on #FREESPACE, visit or follow @freespaceevents on Instagram, and Twitter. The sculptural intervention outside the Zeitz MOCAA will provoke the multi-layered question of transformation and resilience as a defining aspect of urbanisation in the contemporary African city. In South Africa, with a resolutely pragmatic and inventive approach, industrial containers or vessels of mass commoditisation have been repurposed to a wide range of uses, and adapted for places of human production, retail, pleasure, and habitation. The container acts as a symbolic reference for the programme. Inside, the public has access to an immersive experience, reflecting in real time the sharing of #FREESPACE views on the online forum. The visitor is invited to contribute, there and then, to the public debate. In addition, curatorial content further fuels public exchange as artists from diverse backgrounds and disciplines are invited for a 24-hour takeover of the container. Metaphorically, the container transforms into a temporary ‘white cub’ in which the artist can explore through their medium of expression an interpretation of the central topic. As an ‘ark of knowledge ‘, the container will be hung in public space, as a symbolic vessel that conveys memory through the act of migration and change. An allegory to the notion of a transient and adaptive shelter, it represents a lens through which collectively South Africans can reflect and find resonance around the notion or ideal of ‘the diverse nation’. With Zeitz MOCAA and African Centre for Cities, a programme has been established to provoke and stimulate critical discussion. This dialogue takes on various formats of engagement, ranging from talks to panel discussions, workshops and performance. The public events will take place at the Zeitz MOCAA and V&A Silo District on weekends and during evenings in the week to maximise the opportunity for attendance. Public space is explored through the lens of multiple disciplines, reaching beyond the realm of architecture and planning, to expose the intricate inter-relationships that give birth to or impact upon the notion of ‘space’. These provocations intend to reveal some of the drivers that inform the production of space. Topics range from the impact of food security to economic exchange, explorations of identity, diversity, and heritage in contemporary placemaking. The events include South African speakers and artists that have outspoken views on the notion of free space, punctuated by international contributions and global juxtapositions. In parallel an educational programme will take place, enabling children of different age groups and backgrounds to experience, explore and express free space through tutored workshops. The public narrative that subsequently unfolds on Instagram and Twitter will be shared on the #FREESPACE website. This public forum culminates in a physical, spatial representation, reflected in the immersive environment of the container installation, generating an ongoing conceptual dialogue between the virtual public and the visitors on location. #FREESPACE intends to unlock a constructive, multi-dimensional public discourse and platform about the current and future spatial reality of the city. Online and in-situ provocations aim to stimulate public engagement, to enable a broader local and international public to engage across race, age, economic status, professional and cultural affiliation.